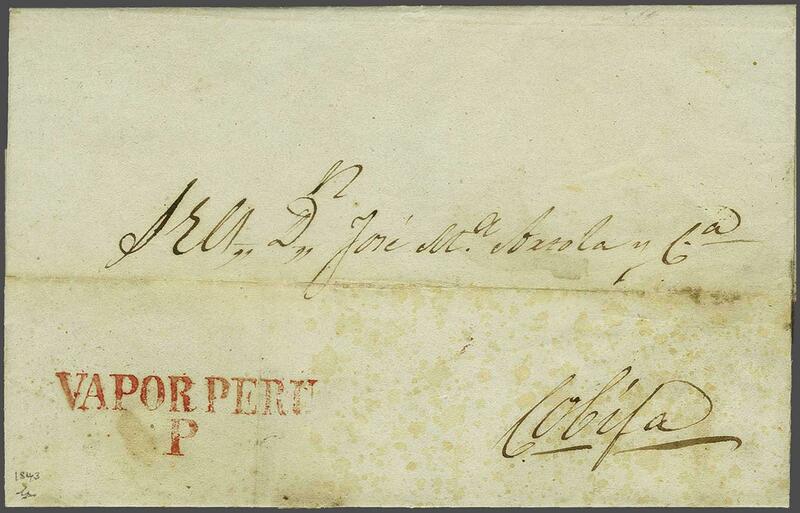 Peru Steamship Navigation Company 1843 (Feb 16): Entire letter from Valparaiso to Cobija, Bolivia struck with fine VAPOR PERU / P handstamp in red (46 x 6 mm). Some age spots and internal tape repair but an early usage of this handstamp (Doublet P1/P2), this being both the earliest and, we believe, the sole recorded usage in red. Rare.rnProvenance: Corinphila sale 90, Oct 1994, lot 6466.